Those were actual words spoken to me last week when discussing the Browns’ position in tonight’s draft. Naturally, the gentleman speaking those words was not a Browns fan, and apparently woefully ignorant of what it means to be a Cleveland fan. The draft history of the “new Browns” was so bad that I started rooting for the team to trade their #1 picks - and the crushing failure they were destined to be - for a handful of #2s and #3s, knowing that their failure wouldn’t be as hurtful—and any upside that much sweeter. 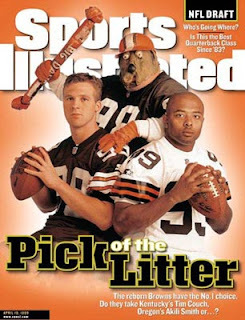 When Tim Couch was drafted, everyone knew he racked up yards in a dink- and dunk- offense. But that didn’t scare the team. Unfortunately. Some picks (Courtney Brown and Gerard Warren, in particular), did look good at the time. I distinctly remember a “Courtney Brown or Trade Down” sign in the stadium. And I agreed. William Green, Brady Quinn, Kellen Winslow, Craig Powell, Clifford Charlton, Mike Junkin. You don’t have to reach to find a disappointing Browns first round pick. Then again, that’s not a problem unique to Cleveland. Perhaps the frequency of failed picks is noteworthy for the Brown and Orange, but the mere existence of failure is evident with every team. Drafting is an imprecise science, to say the least. If it were easy to do, Mel Kiper would be pulling down $20 million a year working for an actual team, instead of making predictions with no fear of failure. “Who the hell is Mel Kiper,” Colts GM Bill Tobin asked in 1994. Exactly. Although, to be fair, Kiper still has his job. The debate about Andrew Luck and Robert Griffin III this year is exciting, fun, and oh so familiar. Pundits may point to 1998, with the decision between Peyton Manning and Ryan Leaf, to draw a “coin flip” analogy to this year’s choice between Luck and Griffin. But there really was never a choice. This has been the #SuckForLuck era for OVER a year now, since before Luck decided to return for last season at Stanford. RGIII came from greater obscurity, and to be honest has excited at least some fans and pundits (including this one) more than a little bit. Unfortunately, drafting a QB isn’t just a coin flip. It has worse odds than that. Think 1999. All the hype was about Tim Couch and Akili Smith. No further kilobytes need to be spent dissecting that decision, considering Donovan McNabb was available as well, and was in fact taken with the #2 pick before Akili Smith. Seven of the first 10 picks in 1999 went on to become Pro Bowlers. Smith and Couch were not two of them. Picking a running back isn’t necessarily easier. Given the wear and tear on their bodies, for every Edgerrin James, Jamal Lewis, Eddie George, and Adrian Peterson, you’d think there would be a Ron Dayne, William Green, or Curtis Enis. In reality, it's not that cut and dry when drafting NFL running backs. Certainly their careers may not be as long as elite quarterbacks, but the propensity for finding a capable or Pro Bowl RB in the first round seems to be pretty high. Between 2000 and 2008, 27 running backs were picked in the first round. Fourteen (52%) of them saw a Pro Bowl. And many of the other 13 were far from the busts of high profile QBs like Leaf, Smith, or Jamarcus Russell. Non Pro-Bowler first rounders include Darren McFadden, Reggie Bush, Felix Jones, and Jonathan Stewart. The greatest fear is injury, and Mel Kiper said this week that injury is a perpetual issue—not just for running backs if you look close. For me it means the Browns need to draft Trent Richardson. My opinion of Colt McCoy is up and down like the stock market. I don’t necessarily buy the “he has no weapons around him” when he can’t seem to hit the ones that he has with an accurate pass sometimes. But I have seen enough flashes from him both on the field and in the huddle that I’m willing to give him some rope to work with. Ideally the Browns will build around McCoy with some capable wide receivers, but even the addition of Richardson to the backfield will free up options for McCoy, and let the coaches, front office, and maybe most importantly, fans, see what they have in young Colt. After all, how much are the distributors of Colt 45 hoping that the Muni Lot business doesn’t just dry up overnight? What everyone else thinks the Browns should or will do varies somewhat, but has seemed to settle on Richardson. Although the threat of a team jumping to #3 to take Trent before the Browns are able is still out there. (Personally, I’d rather lose him than trade the house to move up one spot, a la Butch Davis.) Should Richardson’s name disappear from the board before Tom Heckert can put his name in, I’m all in on Morris Claiborne. First of all, his name is awesome. Second of all, I don’t trust that Justin Blackmon is the stud WR the #4 pick would mandate. Cleveland’s finest are split, with Bill Livingston and Mary Kay Cabot pining for Justin Blackmon, with Bud Shaw and Terry Pluto describing the Richardson choice as a no brainer. SI’s Don Banks agrees, reinforcing that Richardson is the “only elite back in this year’s draft.” And so does the Sporting News. Peter King, on the other hand, thinks the Browns should take Blackmon (and trade for the #27 pick to take Brandon Weeden), but that they actually will take Richardson. I’m not buying this “it’s a pass happy league and the Browns need to get with it” line of Mary Kay Cabot. I don’t care how the Browns score their points, they just need points. They aren’t going to be able to upgrade to elite status this year, so they need to score more and still control the clock. And that means running the ball. I will okay with Blackmon, as he will undoubtedly make Colt McCoy better. 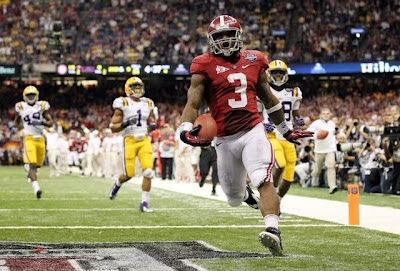 But not as good as Trent Richardson will make him.